A PBS Frontline documentary details the efforts of the NFL to deny and undermine evidence linking violent football collisions with chronic traumatic encephalopathy, which has been found in the brains of several dozen deceased football players. The question of concussions, and their long-term effect on the health of football players at all levels, rises again to prominence. Questions surround South Carolina star defensive lineman Jadeveon Clowney and his “rib injury” which he used to excuse himself from playing against Kentucky, raising the spectre of “first-round-itis” — college stars trying to avoid injury en route to fat NFL contracts. A flap at Notre Dame surrounds Coach Brian Kelly “protecting” his players from “exposure” by deciding they do not need to join fellow students in singing the school’s alma mater after games, win or lose. Students and alumni decry the reasoning. The state of Kentucky’s high school sports governing body deems that teams in all sports no longer shake hands after athletic contests, after a number of handshake-line incidents in recent years. Knute Rockne: His life provides timeless lessons about life and football. Sportsmanship. Integrity. Character-building. Football has ample opportunities to continually teach its participants—and followers— important life lessons. In the coming days and weeks, we’ll explore several of these issues, and share some of the wisdom of a college football icon, Knute Rockne, that can be applied today. 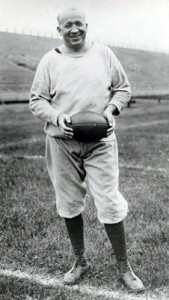 Our years of research into Coach Rockne’s life for our biography, Coach For A Nation: The Life and Times of Knute Rockne, provide a unique glimpse into a perspective that can help us with some of the challenges the game faces today. I’m often asked, “Why did you write a biography on Rockne today?” The answer is simple: The lessons to be learned from this national figure are timeless. The book captures the essence of his life as an educator, teacher, coach, and friend. His life is a relevant reminder as to how football and sport can help shape individual character.